The Chesnutt Mutts' Healing Whiskers. Bernard from Dog and His Boy is clearly more comfortable with this little guy. In my defense, have you ever felt tiny rat feet on your shoulder?? Jasper was very sweet and is training to become a therapy rat. Have your ever held a pet rat? Squeak about it in the comments! Hop over to these other fun blogs listed below. I'd like to meet a rat - hee hee! My momma felt rat feet run across her foot one time - but it wuzn't no pet rat. She wuz totally freaked. Oooh, is this little rat wearing a bow tie?!! That's so adorable!! Oh my dog, Bentley! Thank dog your mom had the rat and not you. They are such terrible creatures! I was forced to spend the weekend locked in a fenced area with one of these rat things hiding. It was so scary. I have more about it coming on Friday, but boy they are scary critters! Jasper was EVERYWHERE at Blogpaws! BOL! BOL! Oh boys, your momma's face is PRICELESS in that photo! I think Ma just peed her pants she laughed so hard! Oh, what a great way to start the day. Both those photos are wonderful! I wouldn't mind a rat on my shoulder just so long as it is someone's pet. I think they are pretty cute and amazingly smart. My sister and I had pet rats when we were kids! they can be smart and fun. We loved to put them on our shoulder then kind of hide them with our hair and wait for peoples reactions when they would peek out. LOL! You are brave cuz our mom would not let a rat touch her. I loved that little rat. Watching it eat a teeny berry during a breakout session was absolutely ADORABLE! Rats can be terrific pets though I think their quick actions startle peeps. Love the expression on your mum's face! Ha, I'd be more like you! OK, that little rat certainly made the rounds. I saw more photos of him on Facebook than any other animal. He definitely got some good training for his new job! Jasper was so sweet & the most loving rat I ever had the pleasure of meeting! I haven't held a rat, but I did sit next to Jasper at lunch and he was eating off a fork. So adorable! I love both of these pictures. Haha! Those two pics are hilarious!! I'm sure I would have had the same reaction at first, but I love learning more about these little guys from Chesnutt Mutts. Isn't it funny how you can kiss a pet rat, but you would never want to touch one in, say, a New York subway station. Dar has a love affair with these rats thanks to Abby! Love the look on your face!! 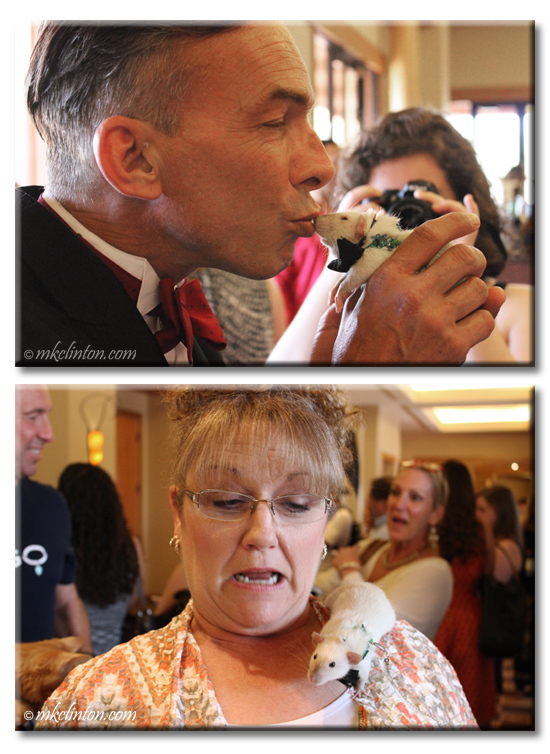 I see Bernard kissed a rat & he Liked it! You, not so much, LOL! Love these pics!